… blue denim is the color of deep sea. … a girl breathes out a deep deep white breath. She likes to take walk in the countryside after the rain. She is always daydreamming and doesn’t want to grow up! This week I will like to introduce you to my Momokos. 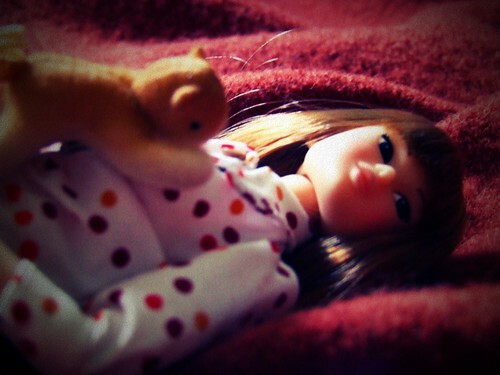 Momoko is a japanese doll created in 2001 by a Japanese software company called Petworks. She is an indie fashion doll that “reflects the lifestyle of today’s Tokyo”. In 2004 Petworks announced a “long holiday” for momoko. The reason was that they wanted to concentrate on other dolls as Mamemomoko, and on their main business (software). Soon after that they handed the doll over Sekiguchi that started production in 2005. Sekiguchi did some changes on the doll, but tried to keep her street-fashion style intact while selling her at more competitive prices. To this day Petworks keeps producing some dolls. PS: If you feel that I’m missing some vital link please let me know!